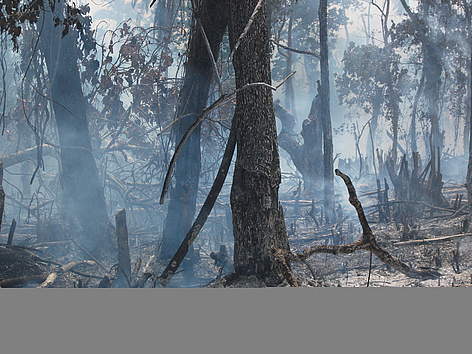 Farmers in Kibaale district set forests ablaze to clear land for agricuture. This is mainly rampant during the dry season. Whether meeting sustenance needs means clearing rainforests or drawing fish from Lake Victoria, the objective for many Ugandans is the same: survival. But could these practices make things even more difficult for Ugandans in future generations? Most Ugandans are completely reliant on natural resources to survive. Forests provide fuel-wood and cleared land frees arable soil for agriculture. Uganda loses about 6,000 hectares of forests every 30 days according. If no action is registered by 2050, Uganda’s per capita forest cover will be zero (NEMA, 2009). Already 28 districts have lost their entire forest ecosystem while another 19 districts have forest cover lower than 1%. As forests give way to agricultural land, the soil is exposed to erosion and loses its fertility. Where cattle are introduced, grazing also affects soil quality, opens the way for invasive species and reduces the diversity of plant species. Other related problems include falling quality and availability of water. Habitat loss also means that endangered species such as the mountain gorilla find themselves increasingly at risk from poachers. This species is now on the brink of extinction in the wild because it subsists in islands of vegetation surrounded by large human populations with growing land needs. WWF works through the International Gorilla Conservation Programme on all mountain gorilla work.